Art as Usual: Still Making Progress! Here's another photo of the Hope Dream Soar piece. I sketched in a clock on the left side of the piece. I kind of wish I'd waited to go get Tim Holtz clock mask but I was impatient to see the image in place. I did erase/scratch it back a bit-it needs to be lightened up and rubbed back a little more. I might still add some metal hands to the clock as well. I've an old clock I can cannibalize somewhere. The flying white bird has a new little brass charm in its beak too. It's a little locked heart. 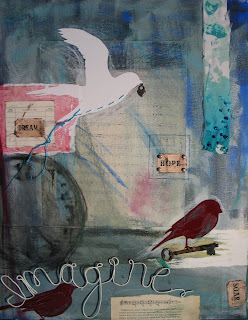 I liked how it tied into the bird with the key.... So more work to be done but I'm liking the look. 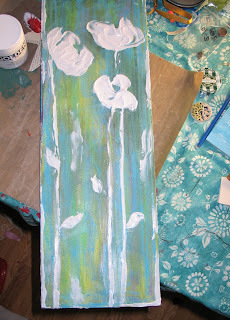 I painted the edges of the canvas this morning and then swiped a bit into the little birdies. I was curious to see how the vinyl decals held on to the paint. They do really well. Coverage isn't great at first because it is a high gloss, fairly impermeable surface so I'm surprised at how well it did take first the colored pencil and then the acrylic. I love the big graphic sihlouette imagery the birds add to the piece. I definitely see more decals in my mixed media future!!! Then because I was having fun I pulled out an old problem canvas and started to play a little by adding oil pastel to the background. It started looking nice so I grabbed my modeling paste and slapped on some poppy forms inspired by a decal from Single Stone Studios. These I'll paint later but I thought the raised form would be interesting. Sooo.... here's a sneak peek at that too! Hope you're all having a fabulous weekend!!! I'm off to church! Love the updates on this project. The clock is cool as is the addition of the 2nd red bird. I really like the way it's coming together!